This is one of those throw in everything but the kitchen sink superfood smoothies. Smoothies can be like a box of chocolates, you never know what you’re going to get when you fill your blender with an array of superfoods. That’s not entirely true, you know you’re going to get an extremely healthy concoction that’s typically quite tasty. This recipe is the brainchild of one of my readers, Ian, who has proven he’s quite masterful at the art of crafting superfood smoothies. Ian was kind enough to pass along this recipe for me to post on my site. He mentioned that there was nothing scientific about his effort. That’s an important statement I want to expound on. When I first started making smoothies I was insanely meticulous about following the recipe and measuring out every ingredient. It took me several months to realize every smoothie recipe in existence is merely a blueprint for whatever I fancied. This is one of the concepts I want people to keep in mind. This site contains hundreds of smoothie recipes. Make them as is, or create your own healthy masterpieces. The latter is what I encourage. And please don’t fret over precisely measuring each ingredient. Honestly, the only time I measure is for the recipes I post on my site. I usually touch on health benefits of each smoothie, but one look at the ingredients and you know this smoothie is uber healthy :) Enjoy! No add-ons necessary :) If there’s an ingredient or two you’d like to include, go for it. I’d love to know if you tried this superfood energizer smoothie and what you thought of it – please do tell in the comments below. Happy Blending! This one was tasty…I doubled the recipe for my boyfriend and myself…I also added chaga, reishi, tocotrienols, super greens powder and camu camu…still delish! Tell me what you think of these additions. Looking forward to more of your recipes…I have a smoothie everyday for breakfast and sometimes for lunch if I am too hungry to prepare something. I love ur smoothies but how big of a glass does it make. 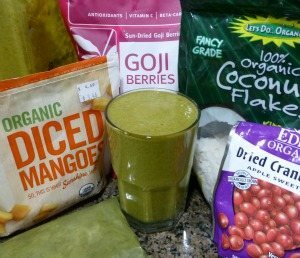 This smoothie is larger than most on my site, which are typically about 1.5 cups. This is closer to 2.5 cups. Feel free to reduce the amount of each ingredient for a smaller serving size.